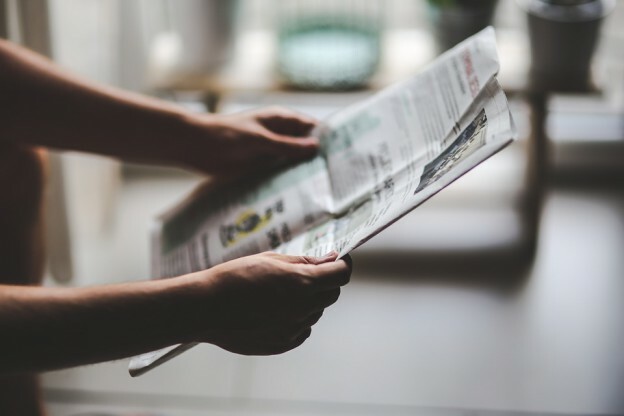 NEW DAY: CAN A NEWSPAPER REALLY BE FREE OF POLITICAL BIAS? The press of a button and – BING! The sound emanates from my laptop as it awakens, a slide of the mouse, a few clicks later and at my fingertips I have instant access to every UK tabloid and broadsheet. All except one… The New Day. On the 29th of February 2016, publishers Trinity Mirror, launched its audacious bid to revive print journalism with the release of The New Day – the first new standalone newspaper to be released in the past three decades. So what makes The New Day different? Well firstly, there isn’t a website, well not a website that offers any news, just one that provides a brief summary of the paper and a promise to deliver balanced opinion, which won’t “tell you what to think.” Though the only way to obtain its daily content is over the counter. Secondly – and most significantly – what makes Britain’s first new newspaper in 30 years different is its intention is to stay free from political bias. “[A newspaper that covers] news and topical content but with a modern style and tone, aimed at a wide audience of women and men who want something different from what is currently available. It will report with an upbeat, optimistic approach and will be politically neutral. It will cover important stories in a balanced way, without telling the reader what to think”. Naturally, young adults are unlikely to remember Leslie Crowther as the first UK host of the popular game show to use that catch phrase, and as a study reported in The Daily mail found – just 12 percent of 18 to 34 year olds paid for a print newspaper in that year. It would appear a shrewd move that The New Day’s target readers are reported as being “time poor” 35 to 55 year olds. To remain free of political bias, is that possible? It’s widely accepted that almost all UK based media has an affiliation to either left or right wing politics. The Independent: A Conservative-Liberal Democrat coalition,The Sun (English edition): Conservatives, The Sun, (Scottish edition): SNP, The Daily Mail and Mail on Sunday: Conservatives, The Guardian: Labour, Financial Times: Conservative-Liberal Democrat coalition, Independent on Sunday: Not endorsing, The Observer: Labour, The Economist: Conservative-led coalition, The Daily Telegraph: Conservatives, Evening Standard: Conservatives, and The Express: Ukip. Quizzical eyebrows are likely to be raised by many to read Labour-supporting Trinity Mirror and non-political bias in the same sentence. Indeed, will this knowledge be off-putting to readers for who’s political loyalties lean to the right? Will they even give The New Day a second glance? The New Day’s success will partly depend on whether they can convince the general public of its political neutrality. “Free from party-political ties” and “Free from proprietorial influence”, in an article posted in Press Gazette. ‘I’ do believe it is different! Comparisons are already being made between The New Day and The Independent’ sister paper The I. What is the outlook for The New Day? It depends which angle you look from. News that The Independent has lost its battle to remain in print- now available online only – may not fill many people with confidence of the viability of such an enterprise. However, on the flip side, The New Day has something unique to offer, and if it can tempt customers to its pages and can consistently deliver unique content that will bring readers back for more, then, who knows? Can The New Day remain free of political bias? Of course it can. But is The New Day the right paper at the right time? To offer something new continually will certainly be challenging. Will it be given a fair chance – politically – by right-wing readers who regard Trinity Mirror as a politically left-wing supporting organisation? Readers, who seek balanced political opinion and journalism will hope The New Day succeeds, or at least, hope it gives inspiration to the newspapers that follow. This post was written by Aled Thomas, a freelance writer for PW Copy. PW Copy provide top-quality content for a wide range of brands, publications and companies. Get in touch for all your content requirements. This entry was posted in Newspapers and tagged balanced journalism, newspapers, political bias media, PW Copy on March 31, 2016 by admin.